The City of Irvine's Keen Center for Senior Resources offers support and assistance to help seniors and their families cope with the physical, emotional and practical challenges of aging. The Keen Center – named after Al and Dorothy Keen, lifelong City residents and dedicated volunteers – is the community's destination for up-to-date senior resources and information. It hosts an exceptional team of bilingual volunteers and staff who can answer questions and provide referrals. Promoting independence, dignity and quality of life. Providing resources, information and guidance to assist Irvine seniors, aged 50 and older, and their support persons. A trained team of staff, volunteers and interns are available to respond to your questions, or assist you with researching answers to any concerns not readily available at the Keen Center. * Appointments are required for these services; please call 949-724-6926. 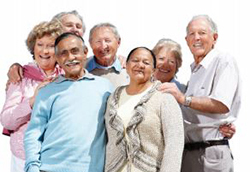 Help seniors living in Irvine by supporting the Keen Center for Senior Resources. Click the "Donate Now" button below to make a donation. View our Outreach Brochure here.